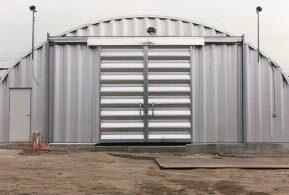 Metal building kits for sports teams, practice fields & courts and other recreational venues. 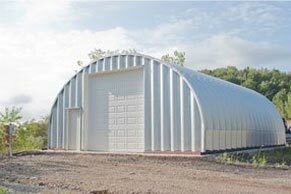 Steel arch buildings are the perfect solution for sports and recreational buildings because of the customizable sizes that give teams the height, width and unlimited length needed for basketball, football and other recreational demands. 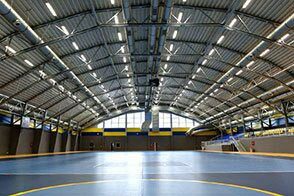 Pre-engineered metal building systems give you a sound and solid structure with an interior you can customize with walls, bleachers, padding, and ceilings with lighting and climate control. Our engineering support is experienced in helping you plan and build your arena’s interior to create a professional sporting venue with all the amenities you will need for your athletes, staff and fans. 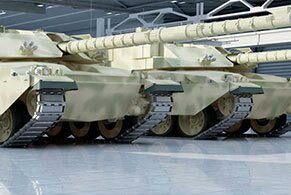 You can customize your sports arena or practice field with custom side walls comprised of electronic roll up doors, sliding doors, windows etc. Retractable basketball hoops and backboards, sound systems, lighting and heavy video equipment can be suspended from or placed on the ceiling as well. 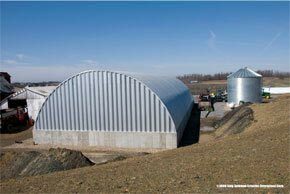 Metal Building Kings® arch steel buildings are perfect fit to house an indoor tennis court, ice hockey or skating rink, swimming pool, soccer field, football field, bowling alley, horse riding arena, volley ball courts, gymnastics training, indoor basketball court, or gymnasium for a school, youth center or church. 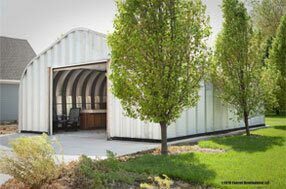 Cost is is important when planning for a recreational building because they typically require large structures to accommodate the activities inside. 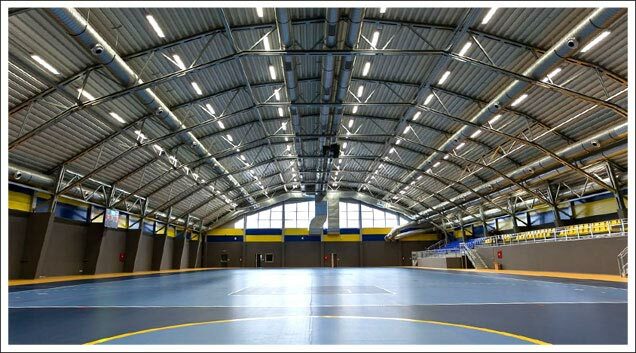 Our clear span building design allows you to save as much as 45% compared with the cost of a traditional gymnasium construction. 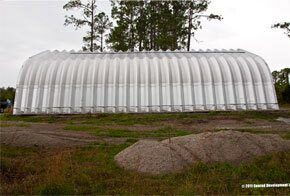 Your Metal Building King arch building is coated with AZ55 Galvalume® - which is comprised of aluminum, silicone and zinc, a state of the art coating to help prevent rust and comes with an industry best 40 year rust-through perforation warranty and a 40 year warranty against peeling paint, flaking an loss of adhesion. Choose from a variety of building colors. 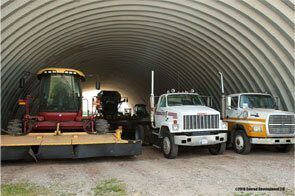 The superior arch metal building construction and design also withstands heavy snow loads and hurricanes, and harsh weather conditions protecting your ports facility. Many of these weather conditions require normal wood construction to deteriorate, need additional painting and repairs. 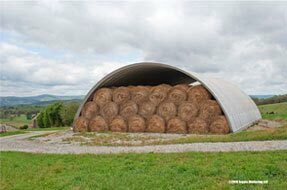 Not to worry with your new metal arch storage building! It is virtually maintenance free. 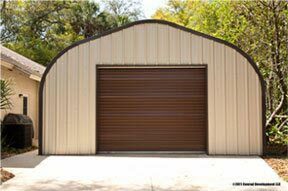 We will work with you choosing the right gauge steel and make sure we meet your county’s building codes. 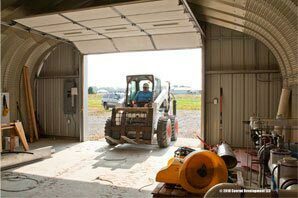 If you require complete turnkey construction of your project, our experienced contractor services department will assist you in getting the job done right or send field construction consultants to assist your local contractor. 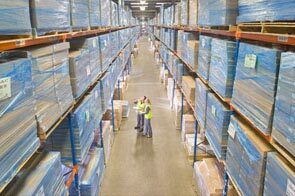 We will help you with floor plans, sports equipment vendors, blueprints, permits foundations and construction from phase 1 through the entire process.